It is hard to make broad generalizations about groups of related organisms. There are always exceptions to any rule. Still, there are some “facts” we can throw around that seem to apply pretty well to specific branches on the tree of life. For instance, all of the gymnosperm lineages we share our planet with today are woody, relatively slow to reach sexual maturity, and are generally long-lived. This has not always been the case. Fossil discoveries from France suggest that in the past, gymnosperms were experimenting with a more herbaceous lifestyle. The fossils in question were discovered in eastern France back in the 1800’s. The strata from which they were excavated dates back to the Middle Triassic, some 247 million years ago. Immortalized in these rocks were numerous spindly plants with strap-like leaves and a few branches, each ending in what look like tiny cones. Early interpretations suggested that these may represent an extinct lycopod, however, further investigation suggested something very surprising - a conifer with an herbaceous growth habit. Indeed, thanks to even more scrutiny, it is now largely agreed upon that what was preserved in these rocks were essentially herbaceous conifers. The fossils were given the name Aethophyllum stipulare. They are wonderfully complete, depicting roots, shoots, leaves, and reproductive organs. Moreover, the way in which they were fossilized preserved lots of fine-scale anatomical details. Taken together, there are plenty of clues available that allow paleobotanists to say a lot about how this odd conifer made a living. For starters, they were not very big plants. Not a single specimen has been found that exceeds 2 meters (6.5 ft) in height. The main stem of these conifers only seem to branch a couple of times. Cones were formed at the tips of the upper branches and not a single specimen has been found that depicts subsequent growth following cone formation. This suggests that Aethophyllum exhibited determinate growth, meaning that individuals grew to a certain size, reproduced, and did not continue to grow after that. Female cones were situated at the tips of the upper most branches and male cones were situated at the tips of lower shoots. The smallest reproductive individuals that have been unearthed are only 30 cm (11 in) in height, which suggests that Aethophyllum was capable of reproducing within a few months of germination. Amazingly, researchers were also able to extract fossilized pollen and seeds from some of the Aethophyllum cones. The pollen itself is saccate, much like what we see in many extant conifers. By comparing the morphology of the pollen extracted from the cones to other fossil pollen records, researchers now feel confident that Aethophyllum is the source of pollen grains discovered in sediments from western, central, and southern Europe, Russia, Northern Africa, and China, suggesting that Aethophyllum was pretty wide spread during the Middle Triassic. Aethophyllum seeds were small, ellipsoid, and were not winged, likely germinating a short distance from the parent. The stems of Aethophyllum are interesting in the own right. Thanks to their preservation, cross sections have been made and they reveal that these plants only ever produced secondary tracheids and primary xylem. The only place on the plant where any signs of woody secondary xylem occur are at the base of the cones. This adds further confirmation that Aethophyllum was herbaceous at the onset of sexual maturity. Another intriguing aspect of the stem is the presence of numerous large air spaces within the stem pith. Today, this anatomical feature is present in plants like bamboo, Equisetum, and the flowering stalks of Agave, all of which exhibit alarmingly fast growth rates for plants. This suggests that not only did Aethophyllum reproduce early in its life, it also likely grew extremely fast. Mature Aethophyllum aren’t the only fossils available either. Many seedlings have been discovered in close proximity to the adults. Seedlings were also exquisitely preserved, depicting hypocotyl, a primary root system, two two-veined cotyledons, and a short stem with four-veined leaves arranged in a helix. The fact that seedlings and adults were found in such close proximity lends to the idea that Aethophyllum populations were made up of multi-aged stands, not unlike some of the early successional plants we find in disturbed habitats today. The sediments in which these plants were fossilized can also tell us something about the habitats in which Aethophyllum grew. The rock layers are made up of a mix of sediments typical of what one would find in a flood plain or delta. Also, Aethophyllum aren’t the only plant remains discovered. Many species known to grow in regularly disturbed, flood-prone habitats have also been found. Taken together these lines of evidence suggest that Aethophyllum was similar to what we would expect from herbaceous plants growing in similar habitats today. They grew fast, reproduced early, and had to jam as many generations in before the next flood ripped through and hit the reset button. Aethophyllums small size, lack of wood, and rapid growth rate all point to a ruderal lifestyle. Today, this niche is largely filled by angiosperms. No conifers alive today can claim such territories. The discovery of Aethophyllum demonstrates that this was not always the case. The fact that pollen has been found far outside of France suggests that this ruderal lifestyle worked quite well for Aethophyllum. The terrestrial habitats of the Middle Triassic were dominated by the distant relatives of modern day ferns, lycophytes, and gymnosperms. Needless to say, it was a very different world than anything that we are familiar with today. However, that does not mean that the pressures of natural selection were necessarily different. 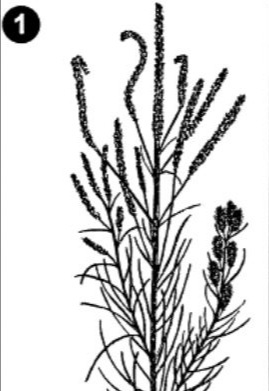 Aethophyllum is evidence that specific selection pressures, in this case regular flood disturbance, select for similar traits in plants through time. Why Aethophyllum went extinct is anyone’s guess. Despite how well they have been preserved, there is still a lot of mystery surrounding this plant.